Pope Innocent III (c. 1161 C.E. – June 16, 1216 C.E. ), born Lotario de' Conti di Segni, was Pope from January 8, 1198 until his death. As Pope, Innocent III represents the height of the medieval papacy. His papacy asserted the absolute spiritual authority of his office, while still respecting the temporal authority of Kings. Lotario de' Conti di Segni was the son of Count Trasimund of Segni, a nephew of Pope Clement III (1187 C.E.–1191 C.E.). His father was a member of a famous house that produced nine Popes, including Pope Gregory IX (1227 C.E.–1241 C.E. ), Pope Alexander IV (1254 C.E.–1261 C.E.) and Pope Innocent XIII (1721 C.E.–1724 C.E.). His mother, Claricia, belonged to the noble Roman family of Scotti. Lotario was educated in Rome, Paris (under Peter of Corbeil), and Bologna (under Huguccio); he was considered an intellectual and one of the greatest canon lawyers of his time. After the death of Pope Alexander III (1159 C.E.–1181 C.E. ), Lotario returned to Rome and held office during the short reigns of Lucius III (1181 C.E.–1185 C.E. ), Urban III (1185 C.E.–1187 C.E. ), Gregory VIII (1187), and Clement III (1187 C.E.–1191 C.E. ), reaching the rank of Cardinal Deacon in 1190. During the reign of Pope Celestine III (1191 C.E.–98 C.E. ), a member of the House of Orsini, who were enemies of his family, Lotario left Rome to live in Anagni. Lotario was elected as successor to Celstine III. On the day the late Celestine III was buried, Lotario was elected Pope and took the name of Innocent III. He was just thirty-seven years of age, and although a deacon, not yet a priest. He was reluctant to accept the Papacy, which itself marks him out from many of the ambitious men who have occupied the same position. Throughout his career as Pope, Innocent III sought to reassert and extend the plenitudo potestatis (the secular power) of the Holy See. The throne of the Holy Roman Empire had become vacant by the death of Henry VI in 1197, and no successor had yet been elected. 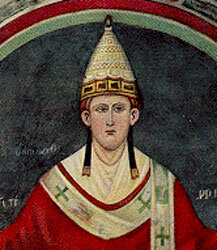 Innocent III took advantage of the confusion to lessen imperial (German) influence in Italy; his first act was the restoration of the papal power in Rome. The Prefect of Rome, who reigned over the city as the Emperor's representative, swore allegiance to Innocent III. The Pope demanded the restoration to the Church of the Romagna and the March of Ancona from Markward of Anweiler and used papal troops to bring this about. In a similar way, the Duchies of Spoleto, Assisi and the Sora were taken from the German Conrad von Uerslingen. The Pope also made use of the weakness of King Frederick II of Sicily (who was only four years old) to reassert papal power in Sicily; he acknowledged Frederick II as King only after the surrender of the privileges that William I of Sicily had previously extorted from Pope Adrian IV (1154 C.E.–59 C.E.). The Pope then invested the young Frederick II as King of Sicily in November, 1198 C.E. He also later induced Frederick II to marry the widow of King Emeric of Hungary in 1209 C.E. After the death of the Holy Roman emperor Henry VI in 1197 C.E., two princely parties had elected competing Kings: Philip of Swabia of the Hohenstaufen family, and Otto IV, Holy Roman Emperor of the Welf family. In 1201 C.E. the Pope openly supported Otto IV, threatening with excommunication all those who refused to acknowledge him. By the decree Venerabilem in May 1202, Innocent III made clear to the German princes his view of the relationship between the Empire and the Papacy (this decree was afterwards embodied in the Corpus Juris Canonici). The decree asserted the papal rights to decide whether a King is worthy of the imperial crown and to arbitrate or pronounce in favor of one of the claimants in case of a double election, as was the current situation with the Empire. He argued this on the grounds that the transition of the Roman Empire from Byzantium to the Holy Roman Emperor had taken place only under papal blessing, and therefore all blessing, coronation, and investiture of the Emperor was dependent upon the Pope. In 1207 C.E., Innocent III changed his mind and declared in favor of Philip, sending cardinals to Germany to convince Otto to renounce his claims to the throne. But Philip was murdered on June 21, 1208 C.E., and at the Diet of Frankfurt of November 11, 1208, Otto IV was acknowledged as King. The Pope invited him to Rome and there he was crowned Emperor as Otto IV (1198 C.E.–1215 C.E.) on October 4, 1209 C.E. Prior to his coronation, Otto IV had promised to leave the Church in possession of Spoleto and Ancona and to grant the freedom of ecclesiastical elections; unlimited right of appeal to the Pope; and the exclusive competency of the hierarchy in spiritual matters. He had also promised to assist in the destruction of heresy (the stipulation of Neuss, which promise he repeated at Speyer in 1209 C.E.). Soon after being crowned, Otto IV seized Ancona, Spoleto, and other territories claimed by the Church, giving them to certain of his vassals. He also invaded the Kingdom of Sicily. As a result, Otto IV was excommunicated on November 18, 1210 C.E. At the Diet of Nuremberg in September 1211, the Pope convinced some imperial princes to renounce the excommunicated Emperor and to elect Frederick II of Sicily. Frederick II made the same promises as Otto IV had done; he was reelected by most of the princes on December 5, 1212, and, his election being ratified by Innocent III, he was crowned at Aachen on July 12, 1215 C.E. Innocent III had forced Philip II of France (1180 C.E.–1223 C.E.) to be reconciled with his wife, Ingeborg of Denmark, and Philip II Augustus became, thereby, Innocent III's ally in the struggle over Otto IV. The Emperor allied himself with England (he was nephew of King John "Lackland") to fight Philip II Augustus, but he was defeated in the Battle of Bouvines in what is now Belgium, on July 27, 1214 C.E. Thereafter Otto IV lost all influence and died on May 19, 1218, leaving Frederick II the undisputed Emperor. Innocent III played further roles in the politics of France, Sweden, Bulgaria, Spain and especially England. In England, there was controversy over the appointment of Stephen Langton as Archbishop of Canterbury, which was opposed by King John. The King was forced to acknowledge the Pope as his feudal lord and accept Langton. In fact, John surrendered England to the Pope, asking for it to be returned as a papal fief. Innocent III was considered a strenuous opponent of heresy, and had campaigns to force the heretics to convert, or be executed. Under his authority, massacres were committed throughout the Papal States, first against the Manichean heretics and under the leadership of Simon de Montfort, 5th Earl of Leicester, against the Albigenses (Cathars), the Albigensian Crusade (1209–29 C.E.). This was a prelude to the legitimization of the Inquisition in 1233 C.E., wherein heresy was said to be punished for the spiritual good of the individual as well as for the preservation of the Church. The Pope supported two new holy orders: the Franciscans and the Dominicans. Both their rules advocated a return to a simpler, more pious life that many saw as closer to that of Jesus and his disciples. Innocent III had also decreed the Fourth Crusade in 1198 C.E., which was intended to recapture the Holy Land. The Pope directed his call towards the knights and nobles of Europe rather than to the Kings; he wished that neither Richard I of England (1189 C.E.–99 C.E.) nor Philip II of France, who were still engaged in war, not to mention his German enemies, should participate in the crusade. Innocent III's call was generally ignored until 1200, when a crusade was finally organized in Champagne. The Venetians then re-directed it into the sacking of Zara in 1202 and of Constantinople in 1204 C.E. Innocent III was horrified by the attack on the Byzantines. Prior to the launching of the Crusade he had insisted that no Christian cities be attacked. He sharply denounced Boniface of Montferrat, commander of the so-called "Fourth Crusade" (1202 C.E. –1204 C.E.) for his actions in seizing Constantinople instead of retaking Jerusalem as his crusader oath had pledged. Innocent III condemned him for desecrating Byzantine Churches in no uncertain terms, sympathizing with the Greeks who called his men "dogs." From 800 C.E., the Popes had claimed to be the representative of Christ the King of earth, legitimizing kingly power. Increasingly, kings claimed that God blessed their succession, even that they were semi-divine. They did not need the Pope. Lacking coercive force, the Popes generally relied on the threat of excommunication to exert authority. This did not always work. Frederick II was excommunicated but still went Crusading, where he negotiated control of Jerusalem for a ten year period. Consequently, without also commanding a degree of temporal power through the control of territories, the Papacy could not expect kings to simply comply. Innocent III restored papal authority mainly by re-possessing the former papal states. Innocent III, in asserting papal authority, left his mark across Europe. For example, Alfonso IX of Leon was excommunicated by him for marrying Berengaria, in breach of the Church's laws of Consanguinity. In 1208 C.E., he annulled Alfonso of Portugal's marriage with Urraca for the same reason. Innocent III also summoned the Fourth Council of the Lateran (12th ecumenical council) in November 1215. It decided to send another crusade to the Holy Land (Fifth Crusade) and issued some seventy reformatory decrees. Among other things, it encouraged creating schools and holding clergy to a higher standard than the laity both in terms of their personal moral conduct, and knowledge of theology. He approved the rule of the Franciscans and Dominicans. If only briefly, he also re-united the Eastern and Western churches, confirming in 1215 that after the Bishop of Rome, the Patriarch of Constantinople was next in rank. However, following the sack of Constantinople (1204) he also tried to Latinize the Eastern Church, while Constantinople remained in Frankish hands as what was known as the Latin Empire (1204-1226; the title of emperor was claimed by Franks until 1383). Innocent III died at Perugia and was buried in the cathedral there, where his body remained until Pope Leo XIII (1878 C.E.–1903 C.E.) had it transferred to the Lateran in December 1891. Although the papal power over Kings that Innocent III established would be short-lived, he sincerely attempted to turn theological principles into actual powers. Two of his Latin works are still widely read: De Miseria Humanae Conditionis, a tract on asceticism that Innocent III wrote before becoming Pope, and De Sacro Altaris Mysterio, which is a description and exegesis of the liturgy. While he may not have been a deeply spiritual man, Innocent III was less worldly and less personally ambitious than many of those who occupied the Papal throne. He was ambitious for the papacy, wanting to restore its political authority. From a modern perspective that regards separation of church and state as inviolable, this may not appear to be a positive legacy. However, the theology of the day said that Christ had bequeathed secular and spiritual authority to the Pope. God through Christ directed all of human life, and Christ did so through his earthly deputy, or vicar, the Pope. At its best, this placed all life under God and elevated spiritual health above material wealth. In practice, more often than not, the Church itself became corrupt and possessed so much material wealth and political power that it neglected its role as shepherd of Christ's flock, as the curator of souls. Innocent tried to restore the balance. He did not neglect spiritual health and wanted better trained clergy. He was aware that the wealth and luxury of the Church compromised its message that where your treasure is, there will your heart be also and for this reason approved the rules of the Franciscans and Dominicans, whose life styles were much humbler than that of most clergy and bishops. He is reputed to have been deeply pious and to have had a profound understanding of human psychology. Certainly, he was far from perfect but he qualifies as one of the more sincere and Godly men to have sat on St Peter's throne. Pope Innocent III set out to restore the temporal authority of the church, challenged by Kings who saw no reason why they had to have papal blessings. They saw themselves as responsible directly to God. This left no check or balance against the power of kings since, rebellion aside, it was almost impossible for their subjects to express any criticism. At its best, the papacy ensured that Kings ruled according to the principles of justness, even if the hierarchical system made the nobility more entitled to justice than the commoners. In theory, any priest could become Pope, so the Popes should hold all people's welfare at heart. Powell (1994) shows how Innocent III's legacy can be praised or denounced. For some he was godly and devoted to serving Christ, within the limitation of his day. His pursuit of heresy may score a negative point from a modern perspective. However, his desire and partial success in restoring East-West Christian unity scores a positive point. For others, he was over ambitious and too full of prejudice, too interested in worldly power (12-14). The Cathars: The Medieval Inquisition in the Languedoc, "Who's Who In The Cathar War: Pope Innocent III (born 1160, Pope 1198 - 1216)". The Languedoc-Roussillon. Lotario de' Conti, "Pope Innocent III", New Advent, Catholic Encyclopedia. This page was last modified on 3 March 2018, at 21:41.